Most children who toil with reading experience the struggle as a reflection of something wrong with themselves – something of which they should be ashamed. The myth that reading ability is a test of intelligence is pernicious. Children don’t know that reading troubles might be due to a normal difference in their genes and brains analogous to being tall or short. They don’t realise the contibution of engagement from the very earliest months of life in stimulating conversations and positive, focused, active learning experiences in the early years to success in literacy. Equally, they don’t see that their failed attempts to crack the archaic and artificially complex code are not their fault. No, they blame themselves. We all search for strategies to protect ourselves from the shame of failing to achieve something, especially something as central as reading and writing. We come up with very complex ways to escape and avoid and channel that shame, most of which aren’t healthy for us or the people around us. We handle shame by avoidance (and yes, I still pay my dues to the gym but haven’t been since March), aggression. (‘What on earth is the point of quadratic equations? I never got them, and it never did me any harm’) or being destructive so as not to look inadequate (‘The alternative voting system is downright stupid’). Children learn very quickly that it’s more socially acceptable to be ‘bad’ than to be ‘dumb’. And of course when we feel ashamed we are caught in a ‘learning-disabled downward spiral’. The humiliation children feel if they struggle with literacy motivates them to avoid reading but, most poignantly, it affects their very sense of self. And this undermines the cognitive capacities they need to learn to read in the first place. I knew a 14 year old who told her parents she was in the ‘5th bottom set’ for maths. There were only 6 sets and she – according to her teacher – was in the 2nd set and achieving highly. It’s all about perceptions. Not only are these learners in danger of continuing to be poor readers, they are also likely to develop aversions to other learning situations that trigger (or which they think might trigger and thus they avoid) similar shameful feelings. Such mind-shame is hugely disabling and it can have an immensely powerful negative effect throughout childhood and into adulthood. Reading failure can result in a host of social pathologies: delinquency, drug and alcohol problems, and – not least – great loss to human potential because of negative life options. It is not that they think literacy is unimportant: quite the contrary. The defence mechanisms are so powerful because they acknowledge the centrality of reading and writing. I can’t cite this source but I have read that the prison building programme in some states of the US is based on literacy rates in 3rd Grade. They can, and do, predict how many prisoners will be arriving in 20 years time on the basis of the numbers of children with reading difficulties at age 9. Now that’s scary. We need to re-frame our thinking about reading, not tinker with the mechanics. I’m as happy as anyone to engage in lengthy debate about the merits or otherwise of phonics as opposed to ‘real books’. But that is not addressing the real concerns about reading failure. We need to understand the challenges involved in learning to read from the learner’s perspective. The majority of difficulties in acquiring literacy are learned, not neurological. If chronic shame is the abiding emotion felt by many children who struggle with reading, then we must not ignore the psychological damage that is being wrought in our schools. All of us want to learn: think of the toddler stumbling and falling, pulling herself upright, trying again. That drive to make progress, to improve, to find out and explore is innate. We just need to harness it – easy to write here, harder to accomplish I know. A lot of children are read to and have loved ones to listen to their emergent reading abilities at home. But for those who don’t come from a rich language background, where there’s not a lot of reading material around, or the television is on all the time, those kids don’t come to school with the same kind of expectations, or the same level of readiness: readiness to learn to read. We don’t always differentiate what we do enough for those children. We wait until they experience some pretty significant failure, either academic or behavioural failure, and then we try some interventions and wait to see how they work. By this time the shame and the avoidance has magnified. Psychologists tell us that the moment that shame triggers, when children become aware of their perceived inadequacy, it distracts and depletes the cognitive capability necessary to do the work. So some children are in a confusing environment. The context perpetuates their perception that there’s something wrong with them, and they’re mortified. And that’s the downward spiral that so many youngsters are caught in. Shame is the greatest learning disability. Not so much because of the emotional attributions we make to it from outside, but because of the utter cognitive disruption that goes with it. We just don’t function well cognitively. This shame mechanism is not at all useful in relation to an unconscious faster-than-thought, virtual-artificial process like reading. It clouds the effective processing of information. Confusion creates a self-consciousness which depletes the brain’s capacity to work out the confusion at the core, underneath at the cognitive processing level. Many children are just developmentally in varying places on the readiness spectrum. Awareness of falling behind their peers damages self esteem and ultimately puts them at risk of continuing failure and low self image and self efficacy. This makes them vulnerable to so many negative influences. It’s just not the lack of the skills, it’s how they feel about the lack of the skills that creates so much unhappiness and dysfunction. It’s our job – all of us – to ensure that all our young people view themselves as capable learners. Thanks to the Children of the Code site for stimulating this. 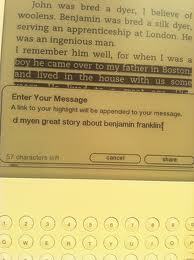 Aimee Daniells‘ interesting post, Fight dyslexia with the Kindle! has ignited this summary of the benefits of Kindles for learners with dyslexia. All that she says relates to all digitalised methods of accessing text of course, but the case for the Kindle is that it is so transportable. Many people with dyslexia can become relatively competent at reading given motivation, good teaching and an awful lot of hard work. It is often the slow speed of reading and the poor organisation of thoughts which inhibits them from becoming fluent. However, for many there will be an instinctive negative reaction to large swathes of text and to overcome this, they must have a real desire to break the barrier. The small progress bar on the bottom of the Kindle shows the percentage of the book that has been read: a great motivator. 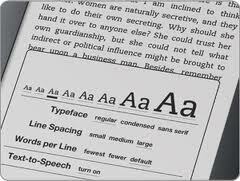 The facility to change text size, font style and line spacing when using a Kindle enables less confident readers to take control of their fear. The text on the plastic sheet looks as sharp and readable as traditional ink on paper. It’s this above all that has made the Kindle a runaway bestseller. And although the text-to-speech specification features a less than pleasant robotic voice it does at least offer the opportunity to access the words in an alternative format. Uploading audiobooks is also an option of course. 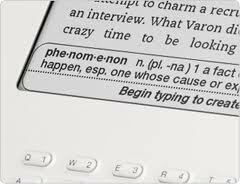 The Kindle’s built-in dictionary is also a boon for learners with dyslexia. Using a conventional dictionary is tough for those with sequencing difficulties, especially if they experience visual stress when looking at densely packed pages of information. I have taken to using my Kindle for reading books to which I wish to refer at a later date; whether for a book group discussion or professional reflection. For this I use the highlighting tool. This facility is particularly useful for people who find it hard to organise themselves. Dyslexics’ desks are often strewn with bits of paper which inevitably get lost. If there is a need to refer back at any point, having the text with notes in the same place helps immeasurably. These highlights can be extracted and re-read with ease. Another great feature of the Kindle is its search provision. This allows you easily to locate specific names, places or events to refresh the memory. Hunting for relevant information can take up huge amounts of time which slower readers can ill afford. The bookmark is also very helpful for finding your place when you return to the book. Fluent readers – ones who love books and/or who are studying from them – ‘annotate, mark up, underline’; their books are likely to be ‘dog-eared, summarised, cross-referenced, hyperlinked, shared, and talked about. Being digital allows them to do all that and more’. to map whether you are confused by a passage, or delighted, or bored. Prototype face tracking software can already recognize your mood, and whether you are paying attention, and more importantly where on the screen you are paying attention. That means that the text could adapt to how it is perceived. Perhaps it expands into more detail, or shrinks during speed reading, or changes vocabulary when you struggle, or reacts in a hundred possible ways. There are numerous experiments playing with adaptive text. One will give you different summaries of characters and plot depending on how far you’ve read. This flexibility might challenge the very nature of books, of reading – something for another post perhaps – but for learners with dyslexia it opens up a whole world from which hitherto they been largely excluded. Professor of Neuroscience at Oxford University, John Stein, and garden designer Tim Fowler, discuss the theory that colours can help with the processing of words on a page. The premise is seen as controversial by those who focus exclusively on language impairment and consequent problems with processing sounds within words so characteristic of many learners with dyslexia. Phonological processing ability is clearly a central difficulty, but to my mind it is not necessarily the only underlying cause of reading difficulties. Differences in dyslexic brains show that auditory processing is not the only indicator of dyslexia. Stein maintains that blue and yellow backgrounds are particularly advantageous for learners with visual stress and thus the designer of the garden has chosen these colours to work with. The garden features books, first closed then open, to demonstrate that judicious use of colour (overlays, glasses) enables many youngsters with difficulties to read. The first part of the garden contains white and green flowers. Along the path are random letters, set higgledy-piggledy in the path. This represents the problems that many learners with dyslexia have with ordering letters, especially when against white backgrounds. You pass by a pile of closed stone books to see a mass of yellow and blue flowers surrounding a path embedded with real words. Yellow and blue are especially significant for supporting learners with specific reading difficulties. The yellow flowers represent the filter that enables readers with visual difficulties to make the letters stay still so that they can be ordered. The visual magnocellular system is impaired in dyslexics: filters make a real difference to their experience of looking at print. Sometimes giving these yellow filters has a really dramatic effect, whereby a child who has been complaining that the words and letters have been moving around or are blurred can find things much clearer with yellow filters. On average, children who benefit from yellow filters will improve their reading by six months in a three month time period, therefore doubling their reading progress. This should be considered in the context that if such children are given no help to their vision then they tend to go backwards (in three months they might only progress one month). Therefore dyslexia overlays can have a significant impact. It is believed that these work in a different way because the blue filters stimulate a kind of cell in the retina that is important for controlling daily rhythms. These are useful because the magnocellular system is actually favoured by yellow light. Therefore, when blue filters are given children are helped to synchronize their body clocks. The children who benefit from blue often have problems with sleeping. Blue spectacles will improve sleeping patterns and they will be able to sleep at the right time and wake up at the right time. There is another benefit in that these same children often get migraines or stomach aches. You give them the blue glasses and these go as well because they all depend upon this hypothalamic clock. Stein’s research provides evidence that 50% of serious reading problems can be helped by the use of blue or yellow filters. 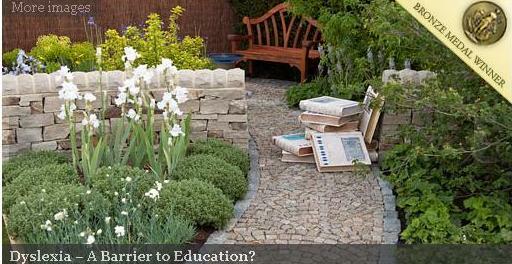 At the end of the garden is an open and enticing book demonstrating that reading is possible. Finally a water feature – a lens shaped bowl – symbolises the importance of calm and tranquility and the reduction of stress (whether visual or emotional) that is so often a feature of learning when reading disabled.